Protect and pamper your feet on the job and save. You need hard-working boots that are as tough as you are. 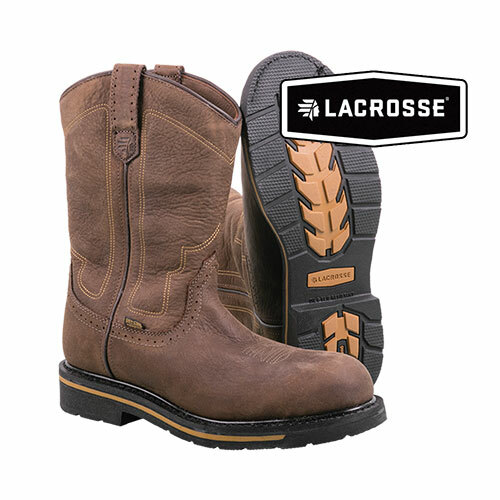 Like these 11" Tall Grass LaCrosse waterproof western boots. They feature full-grain leather uppers for rugged durability coupled with an oil and slip-resistant rubber outsole for sure footing. And thanks to the Quad Core technology boasting 4 layers of cushioning, they're comfortable too. Also features fiberglass shank and pull-on loops. Electrical hazard rated heel and sole. Color: Brown. Mens size 11.5.